Share the post "Clove or Syzygium Aromaticum – One of the Oldest Aromatic Spices"
Syzygium aromaticum (Myrtaceae family) commonly known as lawang or clove, is one of the oldest aromatic spices of the world, which widely recognized for its medicinal and culinary qualities. 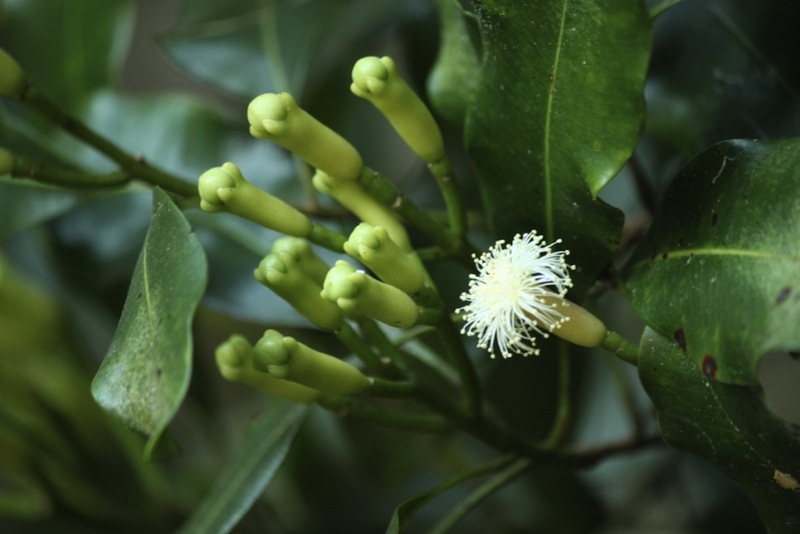 Cloves are the “flower buds” from evergreen rain-forest tree native to Indonesia. It is a a pyramidal or conical evergreen tree with single main stem and obliquely oriented branches, that grows to a height 12 m. Lawang is also known as Laung (Hindi), shriisanjnan, lavanga, deokusumum (Sanskrit), clove (English), Eugenia caryophyllus (Latin). Botanically, the spice belongs to the family of Myrtaceae of the genus; Sygyzium, and scientifically named as Sygizium aromaticum. The flower buds are initially pale in color, gradually turn to green, and, finally develop into bright-red clove buds by the time of harvesting. Buds are generally picked up when they reach 1.5-2 cm in length. Cloves are native to the Moluccas, formerly known as the Spice Islands of Indonesia. They have been consumed in Asia for more than 2,000 years. Owing to their sweet and fragrant taste, Chinese courtiers dating back to 200 BC would keep them in their mouths in order to freshen their breath when addressing the emperor so as to not offend him. Arab traders brought cloves to Europe around the 4th century, although they did not come into widespread use until the Middle Ages when they became prized for their pungent flavor that served to mask the taste of poorly preserved foods. While for a long time, they were cultivated almost exclusively in Indonesia, today the leading clove-producing region is Zanzibar in Eastern Africa. In addition to these two regions, cloves are also grown commercially in the West Indies, Sri Lanka, Madagascar, India, Pemba and Brazil. Cloves have antimicrobial, antiseptic, antispasmodic, germicidal, local anesthetic, anti-inflammatory, rubefacient (warming and soothing), carminative, expectorant, anti-flatulent, stomachic and stimulant properties. Dried flower buds and clove oil are used to cure ailments. The spice contains health benefiting essential oils such as eugenol. It is a phenyl-propanoids class of chemical compound, which gives pleasant, sweet aromatic fragrances to the clove-bud. Eugenol has local anesthetic and antiseptic properties. – Application of a few drops of clove oil mixed with mustard oil is effective in joint pain and muscular cramps. – For acne, apply a paste of clove powder in honey over the affected area. Mix a few drops of clove oil in jojoba or coconut oil and apply over acne. This home remedy not only removes acne but also leftover spots. – Clove oil is an effective insect repellent when diluted with water in 1:10 ratio. Spray this solution to keep the insects at bay. – Cough and throat congestion can be cured by chewing roasted clove. It is also an effective remedy in cases of inflammation in the pharynx (pharyngitis). Another cure is to prepare a decoction by boiling 5-6 cloves in 30 ml of water. Take this decoction with honey thrice a day as an expectorant. – For toothache, pressing a clove bud between the jaws, at the site of aching tooth eases the pain. Apply clove oil in the cavity of decayed tooth. This would reduce the pain and help to ameliorate infection. So, be watchful if you are using medications that slow blood clotting (Anticoagulant / Antiplatelet drugs). – This popular spice has been used in preparation of many regular dishes in Asian and Chinese cuisine since ancient times. Along with other spices like pepper, turmeric, ginger etc. is being used in marinating chicken, fish, and meat. – Some of Indian vegetarian, chicken and rice dishes (biriyani) contain cloves and in the Middle East, it is used in meat and rice dishes. – The spice also features in the preparation of soups, barbecue sauces, pickling and as one of the ingredients in curry powders. Good quality buds release sweet fragrance when squeezed between the thumb and index fingers. Better buy whole buds instead of powder. The buds should be wholesome with stem and sepals, and compact. 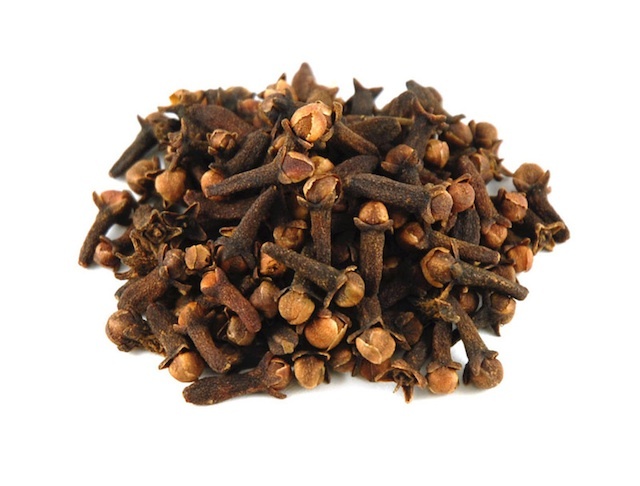 Whole cloves should be stored in cool dark place, in close containers for many months and can be milled using “hand mill” as and when required. Ground/powder clove should be stored inside the refrigerator in airtight containers and should be used as early as possible since it loses its flavor quickly. No information on this blog is intended to diagnose, cure or prevent any disease. This site is intended to be archival in nature. Any remedy or other self treatment shouldn’t be used without being advised to do so by a physician/health specialist.